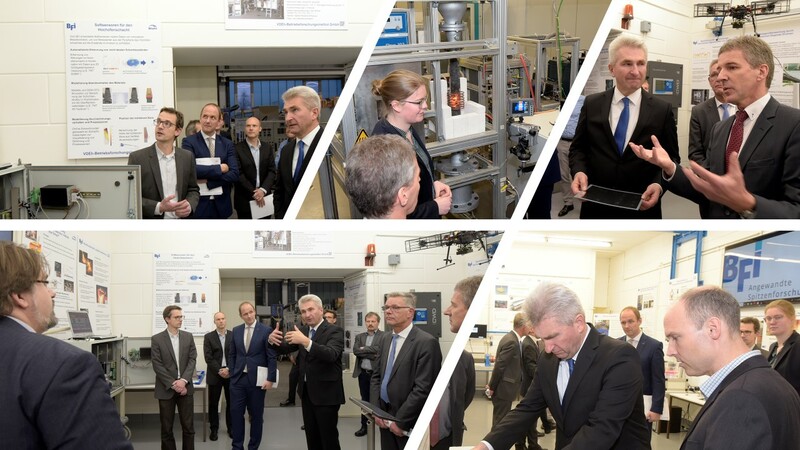 On 30.11.2018 the BFI had a visit of Prof. Dr. Andreas Pinkwart, Minister for Economy, Innovation, Digitisation and Energy in NRW. On a guided tour, the BFI scientists explained and showed him selected projects from the fields of digitisation (measurement technology using the autonomous flying drone as an example, big data using surface inspection data as an example and digital twins as a basis for self-organisation of production processes) and the environment (magnetic separation of particles in water circuits, waste heat utilisation and CO2 reduction). The Minister was very interested and had lively discussions with the scientists and the Management.